There’s something almost magical about an after-school snack. Not for me, although I’m usually tempted, but for Sam. If it was up to Sam, the after-school snack would be part of the Bill of Rights. Actually, if you were to ask him, he would swear that it’s already there. No day is complete without the A.S. If it’s at my office, I usually try to take him something. But every so often, I let him “splurge” on a snack from the vending machine. Somehow, he always picks MY FAVORITE SNACK AVAILABLE IN THE MACHINE AT THAT MOMENT IN TIME. It’s an uncanny talent. At home, the snack isn’t as important as the drink – every snack (every meal, in fact) must be accompanied by a BIG glass of milk. You’d be proud of how good I am in the afternoon. I’m so good in the afternoons when it comes to snacks, that they could put me on one of those posters for healthy eating. But only in the afternoons. Because in the mornings, I’ve mastered the before-school snack. Most times, I make it myself, and it’s usually something like a turkey sandwich or peanut butter sandwich. But my favorite breakfast in the whole wide world is a cheeseburger. I try real, real hard to not have those very often. And I’m usually pretty good. 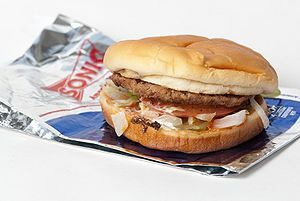 But one of the first things I realized when Sam started elementary school, was that there was a Sonic Drive-in just a few short blocks away. Sonic is my favorite fast food place. And they serve a full menu ALL DAY. In fact, they’re one of the few places where you can get a cheeseburger before 10 in the morning. Now that I’m through with school for the semester, the temptation doesn’t seem as great. So far this year, I’ve been able to just take Sam, and come straight home. But I have noticed a new promotion at Sonic – about a million different milkshakes. And even worse: they’re half price after 8. Maybe we should switch from after-school snacks, to midnight snacks . . .